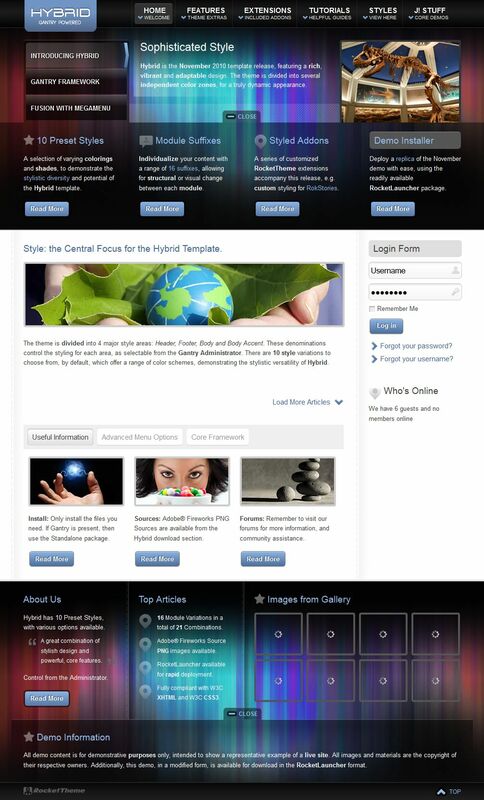 RT Hybrid - another popular pattern from the studio RocketTheme, which now supports Joomla 2.5. This pattern differs rich and colorful design, which is divided into several independent color zones, giving a truly dynamic and unique look website. Design layout consists of 12 preset styles, allowing to provide a large variety of stylistic possibilities. Availability proprietary platform Gantry Framework provides full access to all the settings of the template and adds other standard features such as Fusion with support MegaMenu.